This passage from J. G. Ballard’s short story The Garden of Time (1962) describes the magic flowers that have the ability to turn back time. In The Time Flowers, composers Neil Ardley (1937-2004) and Keith Winter similarly alter our perception of time and space in a 28-minute piece for strings, electronics and improvising soloists. The Time Flowers is one of the most beautiful pieces of third stream music I have ever encountered. Though, to be more accurate, The Time Flowers is a piece of ‘electroacoustic third stream’, a carefully constructed suite for the London Studio Strings (led by Reginald Leopold), Winter’s electronics, and improvising soloists Barry Guy (amplified double bass), Frank Ricotti (vibraphone), Ian Carr (trumpet and flügelhorn) and Don Rendell (tenor and alto sax). The work was recorded for an edition of BBC Radio 3’s Jazz In Britain that was broadcast in September 1971; few people have heard it until this welcome CD debut, which pairs it with a broadcast from April 1971 by Ardley’s New Jazz Orchestra. The Garden of Time has some similarities to Ballard’s first novel The Drowned World (also 1962) in its mood of entropy, a descent into disorder. The short story, spare and elegant, is a fable in which an aristocratic couple – Count Axel and his unnamed Countess – are the only inhabitants of an isolated villa with walled grounds. However their home is under threat from a barbaric horde, which can be seen advancing towards them across the distant horizon. In villa’s garden is a bed of enchanted flowers that when picked can wind back time and briefly delay the inevitable destruction of their aristocratic way of life. In The Time Flowers, the aristocratic couple are represented by Rendell’s saxophones and Carr’s trumpet and flügel, while the string ensemble evokes the villa and its grounds. Of the other participants, Ricotti’s vibes add a glassy element for the crystalline ‘time flowers’ while Guy’s amplified bass adds another set of sounds – disturbing and disorienting, but human nonetheless. Winter’s electronics partly represent the advancing horde, though the sounds this self-effacing academic made from his tangle of synths and effects hardly sounds like a mob. As The Time Flowers progresses, the increasingly dominant electronic sounds, often unpitched, may also represent the couple’s inner thoughts and their acceptance – even as (in Ballard’s story) the countess plays Bach and Mozart on a harpsichord – that their lives are doomed. Barry Guy, known for his groundbreaking work with Iskra 1903, Tony Oxley and the Bob Downes Trio, was an inspired choice to disrupt and challenge the sound world that Ardley creates with strings and jazz soloists. His effects-laden double bass improvisations form a sonic bridge to Winter’s electronics, and there are moments when you are not sure who is doing what. Of course Guy has the ears, improvising skill and command of advanced techniques to respond to the score and to the synths, whose real-time control systems were somewhat limited in 1971. Ardley had been a fan of Don Rendell (1926-2015) long before they became colleagues, and you can hear his admiration for the older musician is expressed in a four-minute ‘concerto’ – after a scene-setting passage for strings alone – for tenor sax and string orchestra. There have been few such sympathetic pairings of improvised tenor sax with composed strings in the history of jazz; Ardley’s compositional dialogue with Rendell stands comparison with Eddie Sauter’s 1961 masterpiece Focus (for Stan Getz). Yet this has an English, Ballardian twist. The strings sit on top of the beat, while Rendell strolls behind with an aristocratic unhurriedness, a tone parallel to Count Axel’s thoughts as he walks among the time flowers. When the end is inevitable, why not savour the last moments? At the end of Rendell’s long section, which corresponds to the moment when Count Axel snaps off a flower and carries it back to the terrace, Winter’s electronics enter for the first time, followed by Ricotti’s vibes and Guy’s amplified double bass. We are six or seven minutes into The Time Flowers, and the sonic landscape has shifted: Ardley and Winter have altered our perception of time and space. After another passage for strings alone, the first soliloquy by Ian Carr (1933-2009) expresses the unspoken anxieties of the countess. He switches from flügelhorn to trumpet with Harmon mute for the next section, a dialogue with the count in which Rendell (atypically) plays alto sax. The dialogues between the two musicians in Ardley’s chilly garden of time contrasts interestingly with their pairing in Ardley’s Greek Variations, the third-stream masterpiece recorded not long after the Rendell-Carr Quintet had come to an amicable end, and the first in a trilogy of Ardley LPs that continued with A Symphony of Amaranths (1971) and Kaleidoscope of Rainbows (1976). In the story, the villa’s occupants have just one time flower left, and the count instructs the countess: ‘Hold it as long as you can until the last grain dies.’ They had spent the morning in the library, reflecting on their shared past; now they accept that the end has come, and the horde invades the villa and its grounds. Yet it appears that the count and countess had been turned into stone many years before, and that the villa is already in ruins; Ballard’s ending confounds our perception that the story took place over a few days. Musically, at this point, there’s no melody, no consonance, merely the shell of a sound as the strings and the synthesisers run through the harmonic series, as if all that’s left are the laws of physics. The Time Flowers is the odd one out in Ardley’s catalogue, never intended as a record release, and never performed live to the composers’ satisfaction. In a parallel universe, the piece might have been performed by some of the more adventurous European ensembles or even the London Sinfonietta, but Ardley, Winter and friends were flying below (or above) the radars of such organisations. Ardley didn’t like to be part of any particular clique or genre. Like any good composer, he was doing his best to make music with the budgets and outlets that were available to him, and the materials and collaborators that excited him. In 1971, Ardley was mainly seen as a jazz composer, arranger and bandleader. 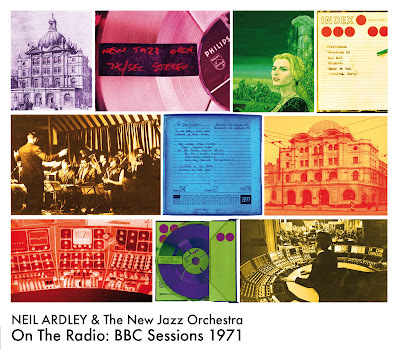 On The Radio’s remaining six tracks are taken from an April 1971 recording by Ardley’s New Jazz Orchestra (including Carr, Mike Gibbs, Barbara Thompson and Jon Hiseman) at the Camden Theatre (later the Music Machine, the Camden Palace and now Koko), complete with dry introductions by Humphrey Lyttelton. The tunes are good – including Jack Bruce’s The Immortal Ninth and Gibbs’s Tanglewood ’63 – but much more of their time and place. There are no compositions by Ardley himself. It’s worth a listen, but the NJO’s studio album Le Déjeuner Sur L’Herbe (1969) has better recording quality and largely better performances, including a superb version of Ardley’s title track. 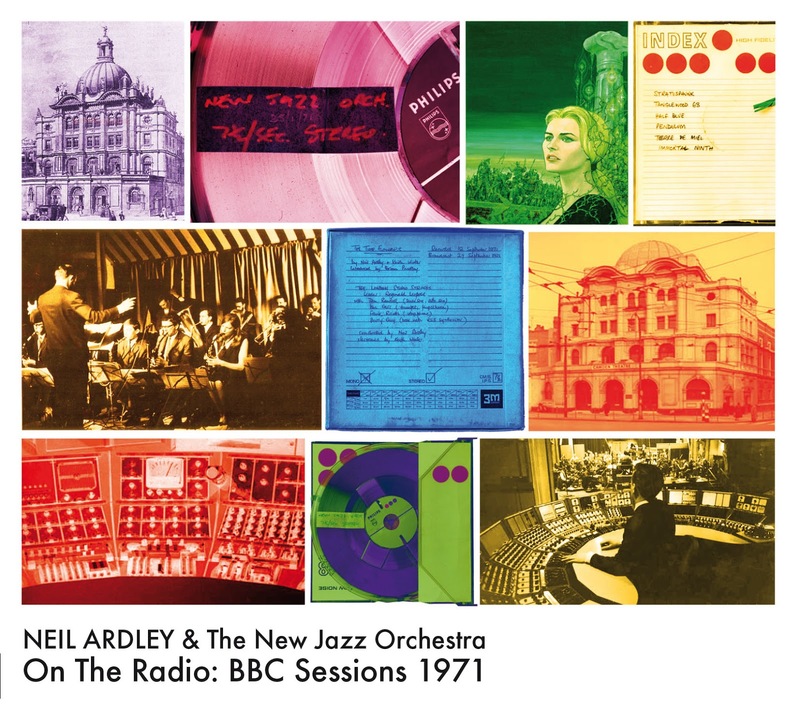 Neil Ardley was already keen to break away from the conventions of jazz big band scoring and to explore the new sounds made available by electronics, by ‘non-jazz’ instruments and by new ways of combining composition with the spontaneity of improvisation. Kaleidoscope of Rainbows may remain the best manifestation of those ambitions, but The Time Flowers adds a valuable and utterly beautiful piece to the fascinating jigsaw of Ardley’s life and work. Beautiful review. Barry Guy actually used a synthesizer too in that performance of The Garden of Time: while the liner notes and the radio speaker say "amplified bass", in the photo of the original tape box featured in the booklet you can read "bass with VCS3 synthesizer". What a wonderful review, Stan Getz once said his favourite recording was ‘Focus’ and this is praise indeed.